Peel both the potatoes and parsnips. Then slice the potato finely using a sharp knife or a mandolin slicer if you have one. Do the same with the parsnips. Butter a large ceramic baking dish. Sprinkle with pepper and salt. Then top with a layer of sliced potato (about 1 potato). Season lightly with pepper and salt. Cover with a layer of sliced parsnip. Season lightly again with pepper and salt. Sprinkle with some of the chopped garlic and add little knobs of butter too. 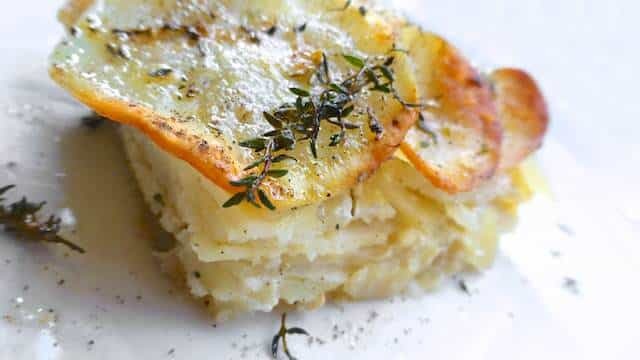 Then keep making layers of potatoes and parsnip like this until you end with a layer of potatoes. Season with pepper and salt. In a small saucepan pour the cream and milk. Also add the strong mustard as well. Season with pepper and salt. Bring this mixture to a light simmer for 2 minutes until warmed through. Then pour this on top of the layered potatoes and parsnips in the dish. Cover with a piece of tinfoil. Put the potato dish in a preheated oven at 428°F (220°C) for 1 hour until soft. Remove the dish and the tinfoil. Then divide the fresh thyme and the rest of the butter over the potatoes. Put the dish back in the hot oven and grill for 5 minutes. Then turn off the hot oven but leave the dish inside for another 15 to 20 minutes until the top layer looks golden. Remove again, let the casserole cool for a couple of minutes. Cut it up and serve.